Good morning! I hope you had a great weekend. Since it was almost 100F here, I thought it was a good time for a summer centerpiece on my living room coffee table. I started with a thrifted silver tray and doily. 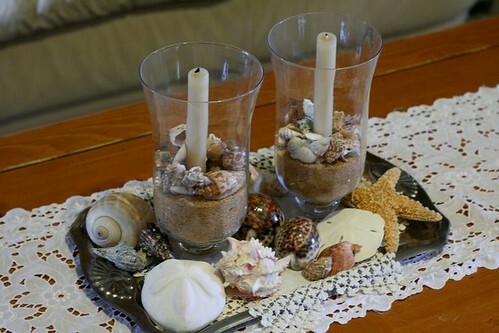 The glass candle holders, sand, and sea shells can be found at Michaels or Hobby Lobby. Very simple and quick to put together. Thank you for stopping by for a visit and I hope you have a great start to your week! That is very lovely Kelli! Very beautiful, Kelli. I love the starfish. Hope you have many blessings this summer. Very pretty, beachy, and summery! Very nice. It's that time of year when we are thinking beachy. Looking at that would take your mind to cooler places. Turned out cute. Looks so summery!! Such a nice idea. Your centerpiece is beautiful Kelli. I love all things beachy and this looks great. Looks great Kelli...I love beach inspired decorations this time of year! 100 degrees...SCORCHING! 100+ degrees- yikes. I think that I appreciate our cooler weather up here much more now... We will be in the 70's this week. Take care and stay in the AC! I've got to get Little Package's shells cleaned up...we took her to the beach the other day. I love the centerpiece. That looks great! I wish I could put things like that out. As it is, the vase I put out keeps getting chunks out of it thanks to a few kids. We have so many beach shells, but I should pick up some sand too! Really pretty Kelli! Thank you for sharing! That looks great. I love the different kinds of shells. I love your centerpiece. I have shells on my front-door wreath and shells on my kitchen table. We've been to the beach quite a bit recently and I just love the way they look and what they remind me of. I think I started my summer decorating a bit earlier simply because I missed the beach! You always have a clever idea to show us! Today is no different! Thanks for the inspiration. Lovely! Always enjoy checking in with you. Your centerpiece looks so pretty! 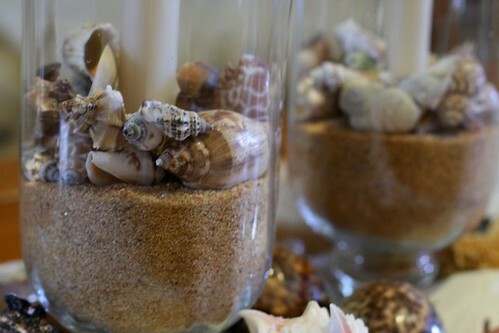 We live on Long Island and have visited many beach areas, so we have lots of shells around in jars and bowls-I always enjoy the beauty of shells. I just looked back at your "4th of July Banner" post from June of 2008-I love it! It will take me until the 4th to complete, so I better start! Very pretty, Kelli! As soon as I get my boxes unpacked I'm getting out my shells, too. I love putting them out every summer! This arrangement is so pretty. 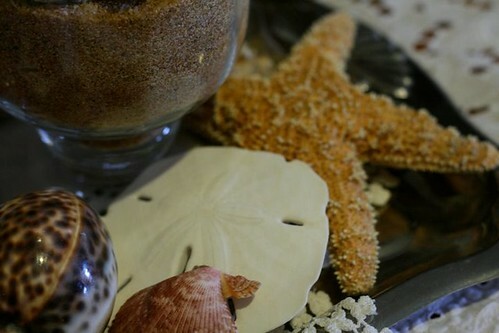 I love using the beach theme in my home. 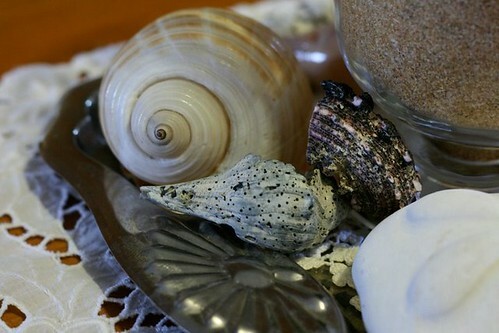 I have many pieces from the beach. I put them everywhere and love the look. Beautiful display. I didnt realize it was almost 100! No wonder I was so hot! My vegs are enjoying it though but guess we're into having to water more. Like ever it's very very nice. 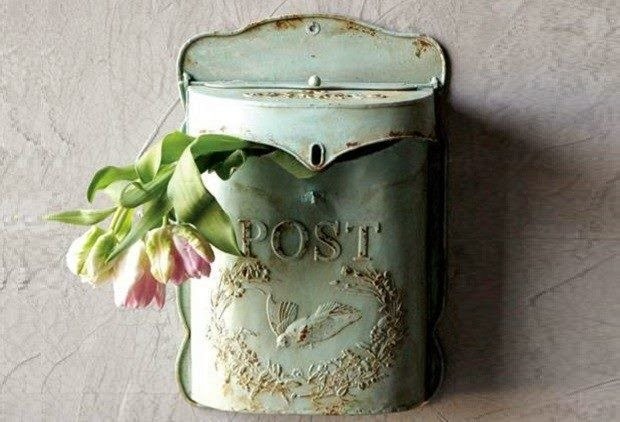 Oh my gosh, that is so beautiful -- and so simple. Oh what an adorable centerpiece! You have the nicest ideas. I like your center piece. I am in the process(very slow one, hehe) of making a sea shell windchime. I just need to actually put it together. Have a great week! 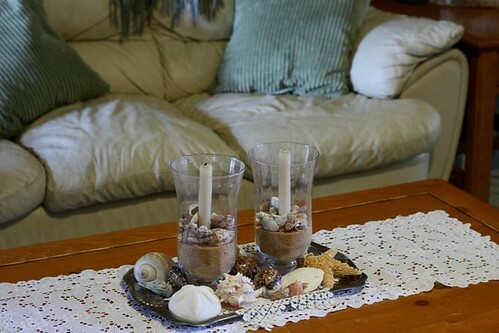 This beachy vignette is very pretty! You certainly have a knack for arranging. Love your center piece!! I'm really into seashells lately! Very pretty! What a fresh serene centerpiece, Kelli. I love it. One could sit and imagine the calming sound of the ocean waves and the cool water and wet sand between one's toes. 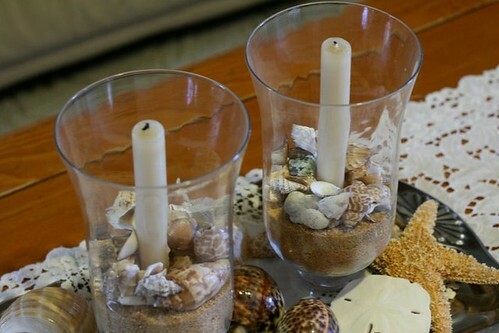 Love the summer shell centerpiece! Makes you want to go to the Beach and find some shells! I found arm loads of shells on Florida's East Coast at Crescent Beach, I had so much fun picking them up. Now my daughter has most and covered a mirror with them. I might need to sneak over there and get a few! Your tray is great too! A lovely centerpiece...looks like summer! Thank you for sharing it. That gives me a great idea for my bathroom! Thanks for sharing such a lovely centerpiece! Love this. What a great job! It's not only your pretty ideas but your splendid pictures that make your blog such a treat. Lovely as always! Hope you and the family are enjoying a blissful and blessed summer so far!